1. Cleanse. You may choose a cleanser for your beauty routine based on your skin type. Whether it be oily, oily combination to combination dry and dry skin, there is a skin care product made especially for you. Some examples and choices for oily and oily combination would be Philosophy's foaming 3 in 1 cleansing gel for face and eyes. What to love about this product is the consistency is a light gel. It is super easy to use. After massaged into face, it will create a lush foam that is then easily rinsed off to reveal a fresh face that does not feel stripped, dry and flakey. 2. Toner. The step in any beauty routine that most are willing to skip. 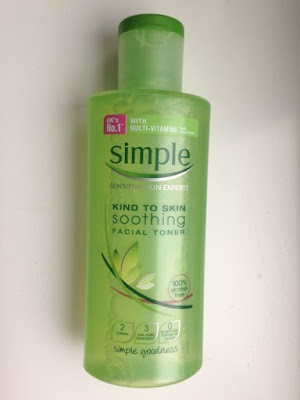 Using a toner without harsh ingredients like witch hazel, will help skin look and feel refreshed The benefits of using a toner is that it helps to prep skin into absorbing beauty products well. Facial moisturizers and facial treatments all have active ingredients that must be properly absorbed into the skin so that their benefits will work better. Simple's soothing facial Toner is made with natural and gentle ingredients that tones your face and leaves skin looking smooth and hydrated. 3. Moisturizer. Your facial moisturizer prevents skin from overproducing natural oils that can give the skin an oily look and feel. In some cases not moisturizing the skin after cleansing the skin can make it dry and flaky. Using a moisturizer based off your skin type is key to good beauty routine. A common skin type would be oily combination. In this case, a light water based moisturizer with a gel like consistency is a perfect choice of product for an oily combination skin type. Another benefit to moisturizing the skin is to leave a smooth base to apply your makeup afterwards. Nivea's Moisturizing day cream is made for different skin types such as normal, and normal and combination. The day cream leaves skin moisturized and is made with ingredients to smooth and hydrate the surface of the skin and improve appearance.